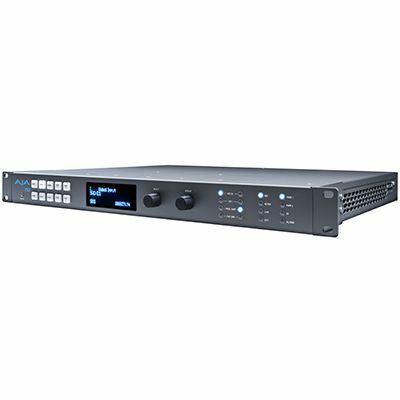 The FS2 can simultaneously work with two independent streams of 3G/HD/SD 10-bit Broadcast quality video and two independent groups of 16 channel AES audio. Each FS2 video channel supports virtually any input or output: analog component or composite, 3G/HD/SD-SDI, Dual-Link and HDMI I/O. You can use the FS2 as two separate Frame Synchronizers/Format Converters, or combine the channels in a variety of powerful ways?for example HD sidebar keying where both the video and background graphics are upconverted and combined. To expand your possibilities further, each channel possesses its own still-store, keyer, and video proc amp/color corrector. The FS2 can up- or down-convert between SD and HD, and cross-convert between HD formats?including 3G 1080p50/60 formats. Additionally, the FS2 has full input and output signal routing, allowing any I/O port to be assigned to either processing channel. For audio, the FS2 has two audio processors?each processor supporting 16-channel AES/EBU digital audio, 16 channel embedded audio, and 8-channel balanced analog audio with a variety of controls for maximum flexibility. The FS2 supports closed captioning and the conversion of closed captioning between SD and HD formats?including full conversion between CEA-608 and CEA-708 caption standards. The FS2 is also network ready, supporting SNMP monitoring and web-based remote control. A 3rd-party Remote Control Panel is available (contact your AJA dealer?or AJA directly, for more information). - Four isolated TTL GPI inputs and outputs for contact closure control. 100-240 VAC 50/60 Hz, dual, redundant power supplies, 55W typical; 80W max. 15A max.